Upgrade to a Bodyguard Traditional base front bumper. Bodyguard Traditional front bumpers feature a schedule 10 pipe frame with diamond plate steel. 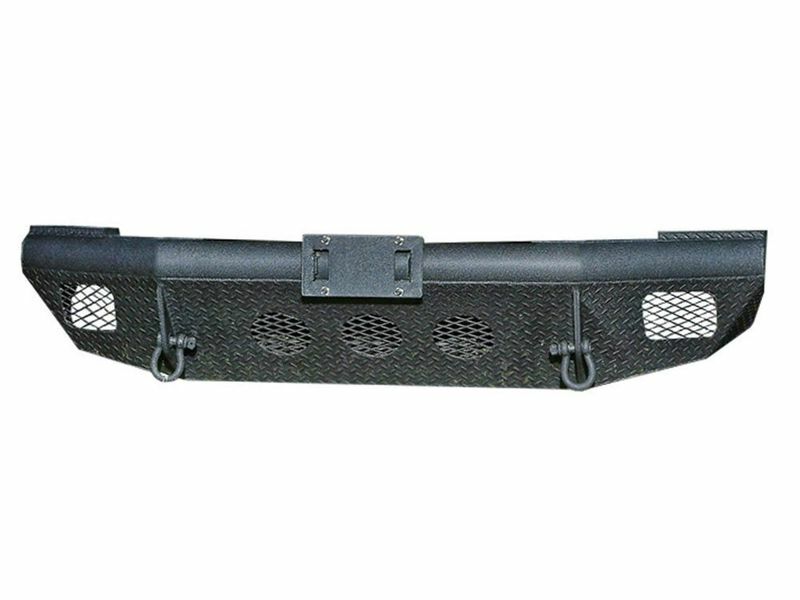 Customize your Traditional base front bumper to fulfill your needs. Bodyguard Traditional base front bumpers come with factory fog light cutouts. Choose from a standard skid plate, 2' receiver hitch, or winch mount with a 16.5 thousand pound capacity. Order yours in either gloss black or textured black powder-coat. Order your Bodyguard Traditional base bumper and bot it onto the frame of your truck with the 3/8" and 1/4" mounting brackets. Bodyguard bumpers are engineered, assemble, and welded at their location in Paris, Texas.Upgrade to a Bodyguard Traditional base front bumper. Bodyguard Traditional front bumpers feature a schedule 10 pipe frame with diamond plate steel. Customize your Traditional base front bumper to fulfill your needs. Order your Bodyguard Traditional base bumper and bot it onto the frame of your truck with the 3/8" and 1/4" mounting brackets. Bodyguard bumpers are engineered, assemble, and welded at their location in Paris, Texas. Bodyguard Bumpers are custom built for you and shipped truck freight. These truck bumpers are warrantied by the manufacture, but are non-returnable. Please make sure you pick all the options you want at the time of order. Options can't be added after production has started. If you are unsure about anything, please call us as we want to make sure your bumper order is perfect. Grab a buddy and a few tools and bolt on your Bodyguard Traditional base front bumper by following the installation instructions.